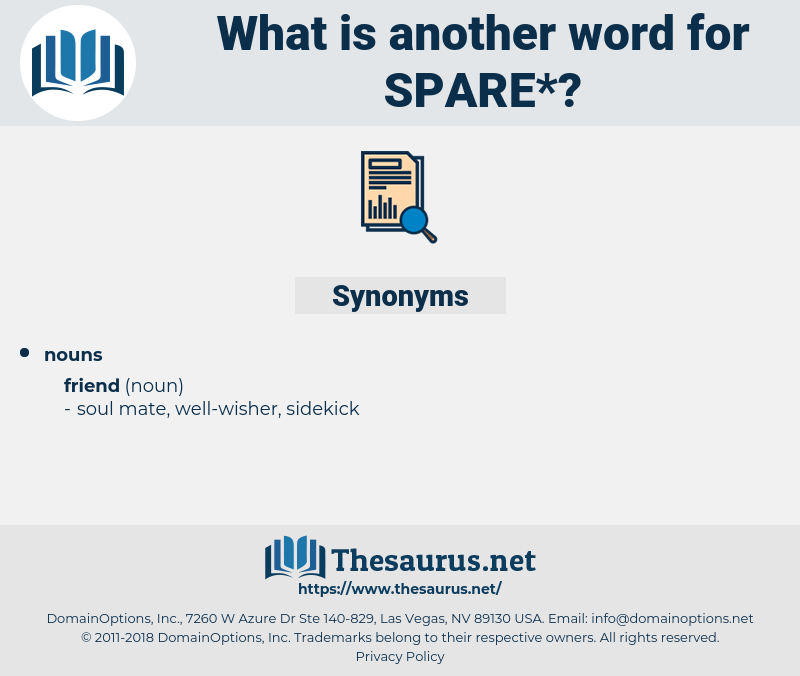 What is another word for spare? Scanty; frugal; held in reserve; not abundant; not required for present use; lean. 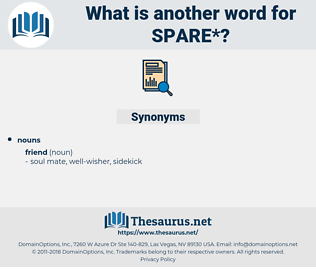 Freer, surplus, assorted, remaining, unused, alternative, amateur, residual, extra, superfluous, supernumerary. saved, saving, guys, save, spend, conserve, avert, devote, dedicate, vacate, exert, borrow. buxom, compassionate, splurging, teeming, greathearted, handsome, bulky, round, surplus, heavy, adorned, poor, hippy, overgenerous, selfless, fleshed out, soft, thriving, swarming, magnanimous, scanty, short, benevolent, niggardly, kindly, hospitable, beneficent, insufficient, scarce, flabby, wasting, proliferative, humanitarian, weighty, good-hearted, shortish, scant, sufficient, decorated, sparse, inadequate, excess, deficient, Frittering, skimpy, bursting, flourishing, blooming, meager, husky, extra, altruistic, enough, openhearted, philanthropic, zaftig. deny, hold, take, keep, need, withstand, spend, waste, refuse. But she could not spare it all. I swear to you Spare yourself. shivaree, sabra, saber, scupper, sprue, spar, savior, savoury, SVR, soapberry, subway fare, sprayer, shipper, spiraea, sushi bar, so far, sipper, shover, shaver, sufferer, saphar, sapphire, shakspere, seafarer, shivery, scoffer, shofar, spry, spray, sweep over, suspire, sabre, shiver, sweep oar, sparrow, sever, sparer, savor, supra, sphere, safari, saviour, shaper, scuffer, spear, spree, spire, siberia, Sopor, severe, superior, saver, Sea Spurry, sea spray, skip over, sophora, spyware, seborrhea, soap opera, spirea, savour, spur, savory, skipper, shopper, sperry, super, suffer, sweeper, spoor, speer, shophar, sapir, secpar, sober, squeeze for, sapporo, safar, Scauper, sapper, spewer, sea gooseberry, savara, supper, shakespeare, spore, spyeria, sea power. free, refrain, relieve, exempt, forbear.